Today we went to meet Buddy for the first time! I honestly don't know who was more excited about it, me or the children! I first spoke to the breeder towards the end of March, when she confirmed that she was expecting two litters in April, so it feels as though I've been waiting forever for today. As we had only spoken by text, I was a little apprehensive as to what to expect, particularly as I didn't even know her full name. 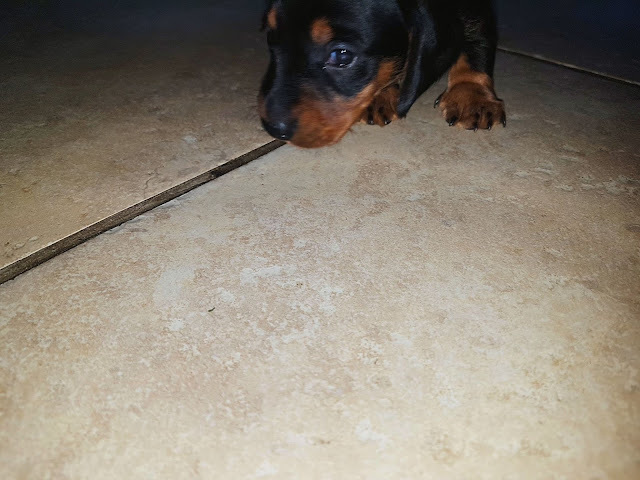 We weren't too worried as it was a friend of a friend but at the same time, I know there are certain steps you should be taking when buying a puppy and there's always a little element of doubt. But there was no need for worry, she was really lovely. The dogs were all kept in her kitchen and a large side room with access to the garden. Despite having a total of 15 dogs and puppies in them, the rooms were spotless. I must admit, I was expecting the room to smell of dog (I know, I know) but it didn't, it just smelt clean. This pleased me no end as I can be a bit funny with smells. 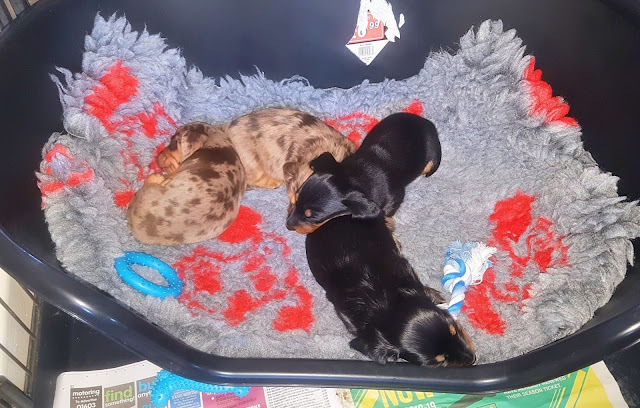 Having seen photos of Buddy with his siblings and with his Mum, today we were able to see the puppies with both Mum and Dad, both of whom were teeny and adorable and, more importantly, looked healthy and happy. Both Mum and Dad were tan and its funny to see how the puppies have turned out. Buddy is black and tan and smooth haired but there are also two fluffy puppies (neither Mum nor Dad are fluffy) and two dappled. I must admit, I had hoped for a dappled as I think they are so pretty looking - but of course, I'm pleased with Buddy. Especially after seeing and cuddling him today. We spent approximately 45 minutes with the breeder and puppies. She answered all of my questions about care and training and said that once we have him at home, we can call her at any time of the day or night if we have any worries or questions. T was very much taken with him and wanted to cuddle him and all the other puppies too. E was a little more reserved, happily fussing them all but worrying about holding them in case she dropped them. We both came home from seeing him feeling reassured and excited about bringing him home. Having seen him interacting with his siblings and starting to investigate his surroundings, he looks like he's going to be a playful boy and I know he's going to bring us all hours of joy. 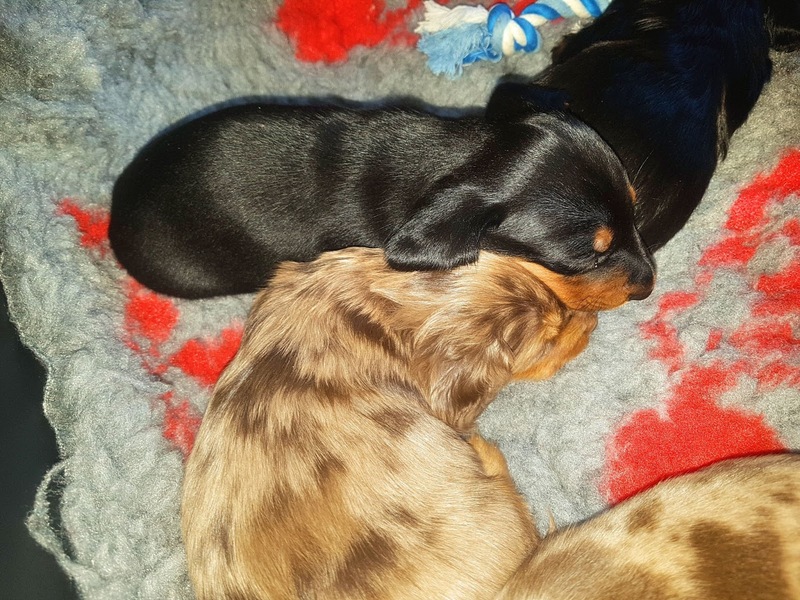 Not only that, but having seen how the puppies are being cared for and speaking to the breeder, its clear that she is kind and absolutely adores them all. She also refused to take the deposit from us, telling us that we could pay for him when we take him home and that spoke volumes to us. Just four weeks until we bring him home! Aw, he sounds so adorable! I bet the waiting time to bring Buddy home feels long.